What is a "Charm Pendant"? We have recently added quite a few highly-detailed family-oriented gold charm pendants to our store. These are actually small pendants, and are fitted with a pendant-like bale. But, because they are approximately 3/4" square, they can also be worn as charms on one of our charm bracelets or charm-holder pins. 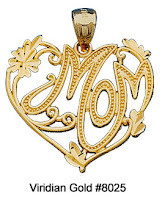 There are quite a few "message charm" designs, which communicate sentiments of affection for Mom, Grandma, and Sister, as well as general heart-shaped designs! And, we also have some special Children and Teen Charm Pendants, suitable for expressing friendship, parental and Godchild relationships. The charm pendant can also be worn around the neck on a pendant chain, making a beautiful necklace suitable for all ages! Since these are also considered pendants, their purchase qualifies for a 20% discount on one of our select pendant chains--just click on the button on the item's description page.